Welcome to the website of Optical Coating Technologies. Scratch resistant coatings from Optical Coating Technologies significantly upgrade plastic parts and this way enlarge the range of their application in various industries. Our own specially designed products as well as conventional coating systems are applied. These coatings are often called nano coatings and they are only a few microns in thickness. They are permanently bonded to the plastic substrate and are typically applied by spray, dip and flow (or float) coating. The application procedures depend on the the base material, the objectives for the optically clear coating and the coating area / component shape. A dust free production environment is indispensable so all our high quality optical coatings are applied under clean room conditions. Found where there is a need for unbreakable or ballistic "glass", such as on special purpose, military and off highway vehicles, along with caravans, signage, and non-structural building glazing. Tinted PC sheet is available for internal use and UV stable clear PC sheet is offered for eternal use. We also CNC profile coated Polycarbonate (and PMMA Acrylic) sheet to achieve highly accurate and repeatable shapes for items such as, for example, lighting covers & diffusers, windows, display covers, instrument covers and engineering components. Optical Coating Technologies applies metal coatings such as gold, silver, copper and aluminium on to plastics using vacuum deposition. These coatings are used, for example, on eye safety wear, medical components, mirrors, semi-conductor wafers, automotive decorative trim and for special effects (for TV, theatre and architect's models). To summarise, our coatings are used to provide optically transparent abrasion resistance, chemical resistance, UV resistance, anti-glare (also known as non-glare), anti-static and anti-fog properties onto safety glasses, lenses, visors, digital signage, TFT and LED touchscreens, point of display units and engineering components. The automotive and transport industries benefit from these coatings on switches, motifs, light guides, external headlamp lenses and trim. A new range of coatings, launched in the summer of 2014, are the anti-microbial abrasion resistant coatings. Some additional information can be found on the Technical page, under SafeCoat 411. 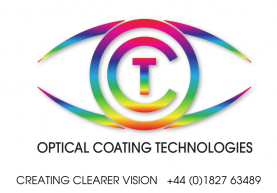 So whether you require your plastic component coated to make it anti-fog or abrasion / chemical resistant, reflective using gold, or would simply like some advice at the design stage, Optical Coating Technologies is the company to talk to. And if you can’t find what you’re looking for on our website, please contact us and ask to speak with our technical staff. And remember, when you order from us, you're not just buying a coating solution, you're buying trust.